Zion Market Research has published a new report titled “Insect Growth Regulator Market by Product Type (Chitin Synthesis Inhibitors, Juvenile Hormone Analogs and Mimics Inhibitors, Anti-Juvenile Hormone Agents), by Form Type (Bait, Liquid, and Aerosol) and by Application for Agricultural, Residential, Commercial, and Others: Global Industry Perspective, Comprehensive Analysis and Forecast, 2017 - 2023”. 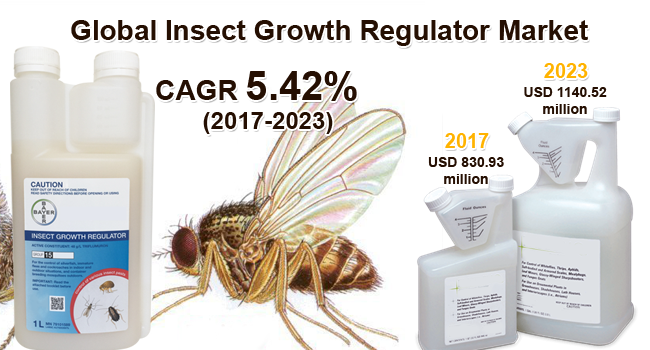 According to the report, global insect growth regulator market was valued at approximately USD 830.93 million in 2017 and is expected to generate revenue of around USD 1140.52 million by end of 2023, growing at a CAGR of around 5.42% between 2017 and 2023. Insect growth regulators are kind of bio-rational compounds that can disrupt the normal development of insects, in both embryonic and post-embryonic stage, and work essentially by interfering with their molting process. The soaring popularity of IGR’s in recent years is attributed mainly to their selectivity of action on specific pests and their non-toxicity to humans and the ecology. Unlike other pesticides, IGRs do not cause instant mortality but affect the hormonal process, and their long-term exposure to pests being treated cause their population to decline over time. The marked compatibility of IGR with other biological pest management systems is a key factor expected to bolster their uptake for controlling pests in agriculture, commercial, gardens, and other sectors. Insect growth regulators are witnessing a huge demand owing to the rising popularity of organic farming. Crop protection products used in organic farming degrade rapidly and have minimal impact on the environment as they are mainly derived from natural sources. IGR’s botanical extracts derived from plants, synthetic pheromone medications, and several other biological pesticides are commonly used in organic farming. These products have a minimal impact on beneficial pests and on the environment. Also increasing use of pesticides is leading to harmful impact on the arable land. Synthetic-based pesticides contaminate the soil and groundwater and have a harmful impact on beneficial bacteria as well as plants. Repetitive usage of these pesticides has led pests to develop a resistance to them, thereby having no effect on the life cycle of the pests. Thus, IGRs serve as an effective mimic hormone interrupting the reproductive cycle of such pests. The insect growth regulator market is segmented on the basis of product type into chitin synthesis inhibitors, juvenile hormone analogs and mimics inhibitors, anti-juvenile hormone agents. Chitin synthesis inhibitors segment is expected to grow at fastest rate in the global market over the forecast period. Based on the type of form the market is segmented into bait, liquid, and aerosol. The aerosol segment is projected to have the highest CAGR during the forecast period. Aerosol insect growth regulators are easy to store and also convenient to purchase in small quantities, which makes them preferable over other forms such as liquid or bait. They are most effective when the spray droplets contact the insect directly, rather than against insects in cracks and crevices. Agricultural, residential, commercial, and others are the key applications segments of the global insect growth regulator market. The agricultural segment dominated the market in terms of revenue in 2017. North America, Europe, Asia-Pacific, Latin America and Middle East & Africa are key regional segments of global insect growth regulator market. North America and Europe are anticipated to remain the leading regions over the forecast period Substantial developments in advance formulations of insect growth regulators are fuelling the regional market growth. Also, the presence of a number of prominent companies in the region is also accelerating the growth of this region. Countries in Asia-Pacific region have a growing agricultural sector and demand for less toxic chemicals which can cause little or no harm towards the crops as compared to other synthetic chemicals used. Insect growth regulator products restrict the growth of insects without having an adverse effect on the environment. Some of the key players in insect growth regulator market include ADAMA Agricultural Solutions Ltd., Bayer Crop Science AG, Dow Chemical Company, Syngenta AG, Nufarm Ltd., Platform Specialty Products Corporation, Sumitomo Chemical Company Ltd., Central Garden & Pet Co, and Russell IPM Ltd. Major players are frequently engaged in mergers & acquisitions to retain their market share and diversify their product portfolio. Also, key parameters affecting competition are rapid adoption of advanced options and rising need for optimum capital utilization.